Includes consult with Children’s Nutritionist, Simone Emery. Start saying “Goodbye” to picky (fussy) eating with Simone Emery today. A guided and supported program to help busy parents understand picky behaviours and nurture a healthy eater. 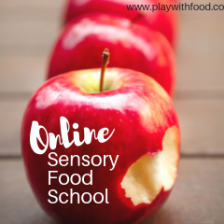 We will go through a detailed understanding of why YOUR child isn’t eating the foods you want them to, how to handle food refusal, anxiety and give you real day-to-day meal inspiration. 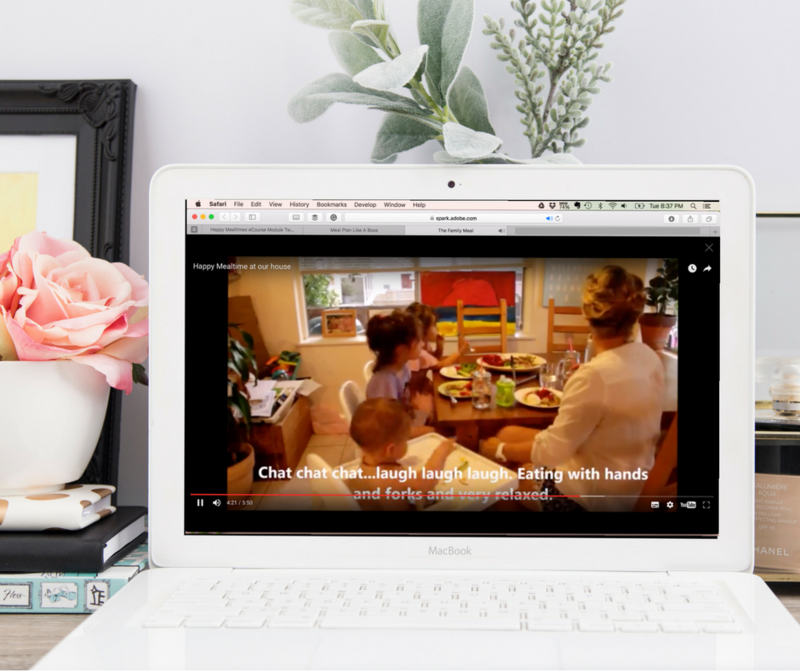 Goodbye Picky Eating comes with instant access to a support facebook group, mobile responsive information modules, videos that are easy to watch and lots of meal inspirations AND a 30 minute one-on-one introductory consult with Simone Emery. Bonuses include many recipes, printables and value packed worksheets. And a meal planning tool unlike any other…. It is designed with picky eaters in mind along with your family’s goals. How would it feel to say goodbye to picky eating? And getting rid of the stress you associate with feeding your family? Do you want to serve your kids a variety of healthy food and see them learn about it instead of refuse, throw, ignore or run away from it? If you want to see the end of tears, frustration and worry over what you child is just not eating, you’re in the right spot. Would you like to see the light of happy mealtimes on your horizon? In 8 easy-to-follow modules, you will be guided by Simone Emery, through at all facets of kitchen and dining life such as nutrition, budgeting, self-reflection, waste elimination, meal planning and how to stuff your sleeves with tools to bring more happiness to the dinner table. What happens in Goodbye Picky Eating with Simone Emery? One 30 minute introductory online consult with Simone Emery ONE-ON-ONE to talk about what your family needs the most from this course and getting you on the right path quicker to happy family mealtimes. 8 easy-to-read modules delivered to you every two days, filled with visuals, videos and activities. A DOR Meal Planner tool designed to be fully tailored to your needs and suit the fussiest of eaters. Teaching Your Kids To Love Food – Diving into the dynamics and influences of eating. This includes access to another stand alone video product available in my shop “Positive Food Talk with Kids” – essential language skill boosting around food without making it the enemy, harping on emotions or resorting to bribery. Featuring accredited practicing dietitian, Meg McClintock. Family Meals – How to eat together without losing your cool. You get to see inside the kitchens of real mums too. Mandy Dos Santos, nutritionist and mum of 3, from LPN features in this module. Picky Eating Explained – Gain a better understanding of picky eating behaviour, red flags for problematic feeding and the tools to keep up your sleeve. 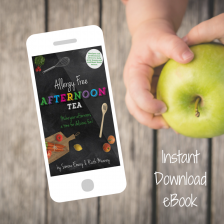 Also includes the stand alone video product “Feeding Toddlers: Parent Hacks, Professional Advice and Strategies” that gives a great assortment of strategies (even for the older child) before the food is even on the table, during the meal and ending the meal. This module also includes a comprehensive audio track about using the learning bowl that I recorded with Jo Cormack (feeding specialist & clinician from Emotionally Aware Feeding) – this is one of the most effective tools to bring to the table to help a child anxious about foods. We talk about knowing when to bring it out, phasing it out and the language to use with this tool. Healthy Budget Friendly Meals – Filled with practical tips and ideas on how you can save money, reduce waste and still create healthy balanced meals for the whole family. Meal Plan Like A Boss! – How to get meal planning working for your family with family-proof hacks, systems and inspiration. This module features mummy blogger and home cook extraordinaire, Shari from GoodFoodWeek. NEW: This module now includes a fully customizable and printable sDOR meal planner tool that Simone designed with very picky eaters in mind along with the Ellyn Satter Division of Responsibility model. There is a video tutorial on how to use the tool. You can also save it to your phone for meal planning on the run. Lunchbox Nutrition and Picky Eaters at School – What are you going to do when your child goes to school / Day Care? How do you reduce their food related anxiety? What can you pack in their lunchbox? This module dives into helping the anxious child, especially when they are eating away from you. We also cover the foundations nutrition, what to pack, food safety, recommended servings for kids and the ergonomics / appeal of the lunch. Selecting Food For Your Family – A nutrition mini-class to equip you with the tools to plan your food selection and read product labels. This module includes information from family nutritionist Nikki Boswell. Screens and Meals. In a technology driven world, this is a relevant module for all parents. How do we stop a techno tantrum? What is happening to our children when they are watching a screen within a few hours of eating? What impact does accessing screens (on a tablet, on a TV or even seeing you on a tablet / phone) before meals or at meals have on children? All of this is addressed in this module along with workable realistic hacks that won’t have you scared of using technology. A very balanced approach to living in a digital age. This module features Dr Kristy Goodwin. You will receive a PDF document immediately on purchase – The handbook for “Goodbye Picky Eating with Simone Emery”! This includes access to the secret Facebook group, the worksheets and links to all of the stylish and mobile responsive modules. You will then also get an email for each module (every second day) so to spur you on, give you more feedback opportunities AND deliver your bonus content (ie eBooks, printables etc). Therefore, it’s important to mark Simone’s email address as a safe sender / priority inbox material. PS – This course is ALWAYS available. It’s not “closing”, “going away” or “not available for the next 6 months” … Why? Because when you want this, it needs to be here for you. Support is only a click away. 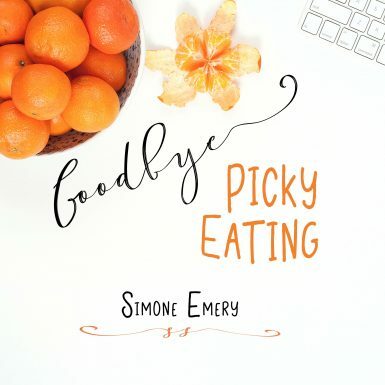 Start saying Goodbye to Picky Eating with Simone Emery today.